It is fall in Barcelona. The air is still warm, although the clouds roll in. Sweaters are donned, light scarves called pañuelos appear. The sun offers a milkwinter light. I sit at my keyboard, making mental calculations, adjusting measurements, checking lists of ingredients, translating words out of Catalan into a language more familiar. It is difficult to pinpoint the exact moment when I decided to become a food writer. After twelve years of literature study and teaching in independent schools, it certainly seemed like an unlikely move, even to me. I suppose it wasn’t a sudden decision but more of a recognition that something inside of me had changed. As so often comes with years of living overseas, I understood the world around me differently. I had come to appreciate the way life is lived in a new place with new customs and a culture different from my own. I learned that a meal is an event, that it is a vehicle for friendship and family, for conversation and for sharing. I learned early on that if I wanted something familiar, I had to learn to make it from scratch. In essence, my journey was one that went backwards. I felt I needed to immerse myself more fully in the culture to understand, so I decided to write a cookbook as a way to share what I had learned not only about the rich flavors of Catalan cuisine but also its rich customs. The path to this project has been long and sometimes labyrinthine, but it is marked by a moment of clarity when my understanding of food here changed entirely. It is spring in Spain and the days are getting warmer. Some friends and I drive to Peñíscola three hours south of Barcelona to spend a weekend on the coast, to soak up the sunshine, to spend time at the water in a place not yet crowded by the throngs of beachgoers already planted firmly along Barcelona’s coastline. The town we arrive in is disappointing at best– a far cry from Catalunya’s famous Costa Brava, which captured my heart when I first came to this country. I long for the windblown strip of arid easternmost land called Cap de Creus, which speaks in poetic gestures of light, sea and sky. The city we drive into is, instead, the kind of city that lines itself up along the sea in an uninspired sweep of high rises and “4 star” hotels, marring whatever view the sea might have had of the Castellón coast. But the white sand beach is largely empty, pert umbrellas are pegged firmly into the sand, and the sun is warm and strong. We make do. The town might be mired down by boisterous hen and stag parties, dilapidated shops selling old toys bleached white by the sun, and endless sweeps of concrete, but it has its simple pleasures, too. It is hard not to appreciate the once grand old castle that sits atop a high hill overlooking both the town and the wide unbroken sea. We climb the old cobblestone streets into the fortified part of the city, admiring the crenellated walls, the heavy, uneven stones with which the castle is built. With time, the town slowly unfolds into a series of postcard moments: a building impressed with thousands of bleached, unbroken seashells. A small rocky alcove which invites the sea into an explosion of ocean water that rinses the balconies of the apartments above it. A traditional Spanish quartet of whitewashed buildings, ceramic-tiled balconies, red geraniums, and blue-shuttered windows. We stop at a small restaurant on the back side of the castle to dine in the late afternoon light. Like most restaurants in these sorts of towns, it is simple and unadorned. A plastic tablecloth, a view of the sea. The menu is filled with the traditional seaside fare, mariscs and peix, grilled and fried, a paella, a fisherman’s stew. Like most menus, the presentation is simple, the language unadorned. Cloïsses. Navalles. Calamars andalús. Only their provenance tells you how they are prepared–breaded and lightly fried. The rest is left to memory and to the imagination. We order something I haven’t seen before, a sarsuela de mariscs, thattraditional fisherman’s stew which is, as its name implies, an “operetta” of fresh shellfish, ripe tomatoes, and wine. It arrives to the table, a deep brown broth punctuated by the white shells of clams, the pink carapace of oversized shrimp called escamarlans–our version of crawfish–the blue-black iridescence of mussel shells. A basket of plain white baguettes is plonked down next to the oversized paella pan. I am expecting merely good. The meal is, in short, a revelation. A revelation that makes the cuisine come alive for me in a way it never has before. It makes me want to learn how to cook all over again. I grew up no stranger to rich and intricate food. My mother was the kind of cook who–in friends’ reminiscences–could make something out of nothing. Cheap cuts of steak became mouthwatering, slathered in five spice powder, soaked in tamari and soy sauce, covered in round discs of lemon and crisp white slices of onion. She served lamb still pink on the inside, accompanied by a bright mint jelly. Potatoes were drenched in cream and pats of salted butter and buried under the dark bubbling crust of gruyere cheese. Fat spears of asparagus were drizzled with a bright lemony hollandaise sauce. Her copy of Mastering the Art of French Cooking–her bible–sat out on the counter, covered in traces of all of the recipes she made. There was never a dish too ambitious, and yet there was always time for a simple grilled cheese on thick cut farm bread, golden, salty and filled with the tart bite of mature cheddar. We never ate it without a can of Campbell’s tomato soup. There was never any room for dessert. Perhaps in part because of this upbringing, I came to Barcelona filled with expectations about the food. I loved to try traditional dishes out at restaurants, but it was another thing to recreate them at home. It was a challenge I simply didn’t feel up for. Not only did I lack a repertoire for cooking local dishes, but I hadn’t given up my taste for comfort foods. Worse, I was turned upside down at the grocery store where I couldn’t find anything familiar. There was no spice rack, no fresh milk, no cheddar. I couldn’t find American bacon or peanut butter or the foods I wanted to make for holidays. Whole fish stared out at me from the fish counter complete with heads and razor sharp teeth. Skinned rabbits with unnaturally large eyeballs leapt out at me from the meat case. Legs of ham–that prized jamon–hung from special racks and made me dizzy with their scent. While many might relish the possibilities presented by these displays, I felt completely overwhelmed by the newness of it all. Perhaps some adapt faster, but I was trying to manage a full time teaching job, a new country, two new languages, and a washing machine that took three hours a load. I had no time to learn a new culinary language as well. As a result, I never learned to cook local foods and instead resorted to a shoddy approximation of the dishes I used to make. Over time, my love of cooking became more memory than reality. Most people–like the culinary heroes I grew up with on my mother’s bookshelves–Alice Waters, MFK Fisher, Julia Child–romanticize the idea of throwing themselves into a new culture and a new cuisine. They envision trips to the European markets, laden with a bounty of food they imagine to be fresh from the ground, unprocessed, and whole. They dream of bringing home long loaves of bread peeking out of cloth bags, still warm from the oven. Largely, that image of the Europe I know is true. The eggs I buy almost always have soft tufted feathers on them, and they sit out in the supermarkets unrefrigerated. The carrots are often unwashed, dirt still clinging to their rooty tips, their long feathery fronds still attached, making them complicated to carry home. I have come to appreciate the fact that the food here is imperfect, the cuisine rustic and whole. The lack of specific measurements in Catalan recipes used to confound me. Now I recognize that a measurement is a guideline for what is known by heart and hand. As I make my way through a kitchen filled with new scents and flavors, I carry with me the memory of my mother as a passport to new understanding. I know now that salt simply means the way your mother once showed you and that olive oil needs never be measured. Although I have had this salad on certain occasions at restaurants around the city, the folks at Espai Boisàreally made it come alive for me. I loved their version of the smoky romesco sauce that we normally reserve for grilled vegetables and the famous spring onions we eat when the weather begins to turn warm. I highly recommend taking a cooking class there if you visit Barcelona. When cooking with dried salt cod, you will need to soak it in cold water in the refrigerator for 24 to 48 hours before using it in order to rehydrate it. Because it is heavily salted to aid in preservation, you should change the water every 4-6 hours during the soaking period in order to help desalinate it. When it’s finished soaking, chop the salt cod roughly and set aside. To compose the salad, plate the lettuce. Divide the tuna among the four plates and top with salt cod. Add the anchovies, olives, and then drizzle with a bit of olive oil. Top with the romesco sauce, add a sprinkle of salt and freshly ground pepper to taste. Romesco takes the stage every spring as the complement to the grilled spring onions called calçots. Its warm, smoky flavor goes well with all kinds of grilled or roasted vegetables. If you can’t get calçots, Romesco can be served with grilled or roasted leeks or used as a dipping sauce for roasted artichokes. If you can’t find ñora peppers, jarred roasted red peppers are an excellent substitute. I’ve also used bread crumbs in place of the toasted bread. Normally the dry elements–the nuts and toasted bread–are ground using a mortar and pestle before incorporating in order to keep the sauce thick, but a food processor makes life easy. One day ahead, soak the ñora peppers in the water in order to soften them. When you are ready to cook, remove the peppers from the water and remove the seeds. Set aside. Preheat the oven to 400 degrees. Rub the garlic to remove any extra skin, slice the top, and place in a baking dish, and add the 2 tablespoons olive oil. Place the tomatoes in a separate dish, drizzle with a bit of olive oil and roast both for about 15 to 20 minutes until soft. Let cool and then peel the tomatoes. Squeeze the softened garlic out of its skin. Set aside. Rub the bread with some olive oil and toast in a pan with the nuts. Stir constantly to prevent burning. Place the tomatoes, garlic, nuts, toasted bread into a food processor with the rest of the ingredients and combine. Brought by the Italians in the early eighteenth century, canelons are now one of the most traditional dishes in Catalan cuisine. This is a typical Christmas dish usually made on the holiday of Sant Esteve which falls on the 26th of December, although it is eaten throughout the year. Canelons are made with a variety of fillings, including roasted chicken, veal, and lamb. This vegetarian version is quite common as well and the filling is often made as a side dish here. Soak the pasta sheets in hot water, per the instructions on the package. Heat a tablespoon of olive oil over medium heat, add the pine nuts and cook, stirring constantly, until they begin to turn golden. Add the raisins and the garlic and cook for 1-2 minutes more. Add the spinach and cook until wilted. Add salt, pepper and clove. Set aside. To make the bechamel sauce, bring the milk and the bay leaf to a gentle boil. Turn off stove and let sit. Meanwhile, heat the butter in a pan. Add the flour and stir until it begins to turn golden without burning. Remove the bay leaf from the milk and add it to the flour mixture, along with the nutmeg, cinnamon, and salt, stirring gently until lumps disappear. Cook for 30 minutes or so, stirring occasionally. Do not overstir. Stir in the cheese. 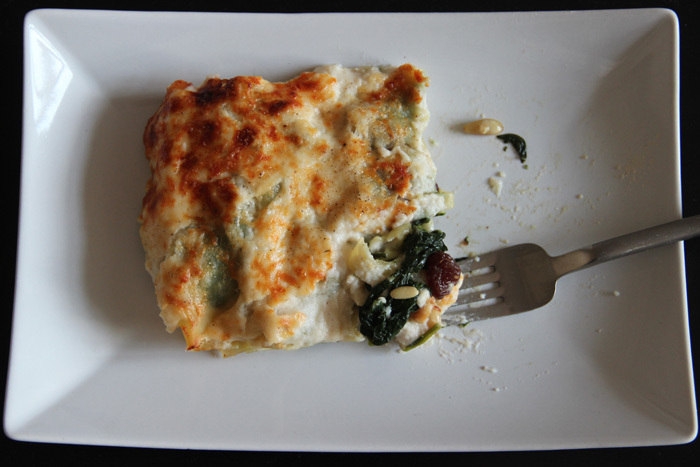 Cover the bottom of an oven-safe dish with a thin layer of the bechamel sauce. Place a tablespoon of the filling into the center of each pasta sheet, roll, and place in the dish with the opening facing down. Top with the rest of the bechamel sauce, sprinkle with the cheese. Dot with the pieces of cold butter. Place in oven, cover with foil and bake for 30 minutes. Remove foil and cook for another 5 to 10 minutes until the cheese is golden brown. *Notes: Here, the sheets of pasta for canelons are sold flat in a box similar to lasagne pasta sheets, and are quite small, about the size of the palm of my hand. I use the pre-cooked kind that only need to soak for 20 minutes before using. A whole box of 16 sheets makes enough to fill a 9 by 11 baking dish. If you cannot find something similar, the regular Italian cannelloni tubes will work, although you may have to increase the amount of filling. Because they will be difficult to fill, after you cook or soak them according to the instructions, you may want to slice them open flat, fill and then re-roll them. Melissa Leighty (MAPH ’06) is a freelance travel and food writer for VeryChic and Catavino.net. She blogs about her experiences living and cooking in Barcelona at Tartine and Bean. She is currently working on her first cookbook about Catalan cuisine.